Posted July 16th, 2012 by David Porter & filed under MailBigFile, Social. Are the Olympics A Logistical Triumph for All Concerned? During the London Olympics there will be many heroic cases of struggles against all odds and of victories and human excellence achievements in every sport. Even more so in the Paralympics that follow the Games. However, spare a thought for the triumph of modern logistics that will be all the back up, transport, supply and waste services. The way in which the complexities of the nationwide torch relay have been handled was a taster of what people can do when applying their minds together. Of course, in the event, the reality could be that London simply grinds to a halt because transport/policing/public order/supply cannot keep up. But let’s assume not. Let’s hope that the nation who has delivered the Olympics on time (and some estimates say below revised budget levels) can pull off the scoop of the decade in terms of organisation. Almost 15,000 athletes and around 11m spectators will have to be moved to and fro the sports areas. The public transport infrastructure of London frequently runs at or above capacity on normal working days. Will the airports, buses, tubes, trains, taxis and the new high wire cable cars over the Thames cope? Somebody has estimated 14 million meals will be served during the Olympics (though that could well be a low guess) and the waste that all that many people generate has to be disposed of too! The 24/7 on-site McDonald’s can seat 5000 at any one time! 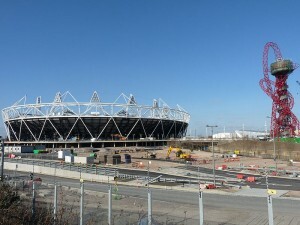 All the security services have been preparing for the event from before the decision to put this year’s Games in London. Various terrorist threats are real and taken seriously. The media know about and have reported on some aspects, such as missiles positioned at strategic sites around London, extra security especially at the sites. Every piece of modern surveillance technology will be deployed to minimise disruptive activity. Peaceful protest looks unlikely to be allowed much of a platform; anything more threatening will be dealt with swiftly and ruthlessly. For spectators it will seem very like departing/arriving at an airport, with things that can/cannot be brought with people and how searches will be conducted. Links to the police and to the NHS services for those who fall ill are well documented on the Olympics sites and the whole project gives off a confident air of organised calm. As ever with these massive events, the true extent of defensive measures is never revealed. Nor should it be. The other unknown element is that the whole of Britain’s capital city has to keep on functioning as normal during the Games, or at as least normally as possible. The demands of the economy are still paramount. Employers have been devising ways of having staff work from home, but not all work lends itself to that. Numbers will take holiday time or ‘sickie’ time in order to watch the events from home as well. But the bulk of the commercial, industrial and domestic life has to carry on. Many business will be hoping for beneficial spin-offs from the Games with increased activity, which will further complicate the picture. There are already examples of businesses collaborating to share and stagger deliveries, of stockpiling in advance to make it easier at the time. Small businesses and large are having to think up Plans A, B and C. Deliveries, repairs, emergencies are all being factored in. But the unexpected is always a visitor at any well-organised event. Changes to road directions/priorities and some closures and altered public transport networks are well posted in advance, and indeed will begin operating before the Games get under way. The knock-on effects of these disruptions will be felt across the whole of London and possibly beyond. Transport and logistics are being co-ordinated by the Department for Transport, the London Organising Committee for the Games (Locog), Transport for London, all the Boroughs and the Mayor, Boris Johnson. So far the majority of participants and most commentators are full of praise for the way discussion, consideration, collaboration and proper communication have been tackled to leave nobody out, big or small players.The issue of drafting in more troops to support the security provided by the expensive G4S is the latest problem to rear its head, just days away from the start. And, unless there is something we are not told, there is no sign that all this was put together, planned and executed by some massive nova-computer! Get head of the Games, TfL.